In this day and age, compliance & documentation is paramount, especially where blame could be placed in the event of anything going wrong. The only way to cover yourself or your company is to call the experts in to give their professional opinion. We inspect & test electrical installations meticulously and issue our findings in tidy, software produced, official inspection and test forms which are easy to understand. 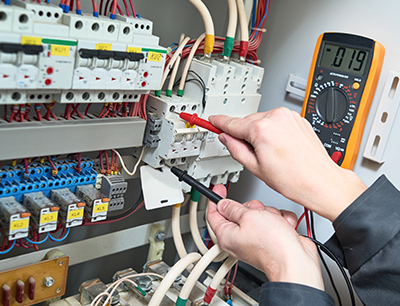 The inspection & testing of electrical appliances, circuits and installations is one of our specialities at etech and we love being good at it. As well as attending regular training courses to keep up to date with any changes to legislation, we also run in house training for all of our engineers to keep every ones technical knowledge refreshed and up to date. We have decades of experience and a full range of specialist, regularly calibrated, test equipment and instruments for inspecting & testing domestic, commercial, industrial and agricultural appliances & electrical systems. From carrying an electrical installation condition report in any environment or tracing and diagnosing an electrical fault to commissioning our own installations there really is no limit to our expertise.